Once upon a time, Holland Point had a beach. Even then, frequent storms undercut the slope of the shore, recalls Janet Bates, then a girl in the 1920s. The shoreline today slopes gradually toward the water and is bolstered with layer upon layer of interlocking stones. Now waves  which can top four feet in a storm  no longer carve out the bottom and rarely splash over the top of the wall. Every Chesapeake neighborhood has its own way of looking at the water. Each is just as unique in how it lives with the Bay and its tributaries. One way or another, communities along about a third of Maryland’s 4,360 miles of tidal shoreline must manage erosion to keep their waterfronts. At the extreme, in neighborhoods on Calvert County’s prehistoric clay cliffs, erosion brings homes ever closer to the edge. Yet holding back the tide means destroying the habitat of the endangered tiger beetle. 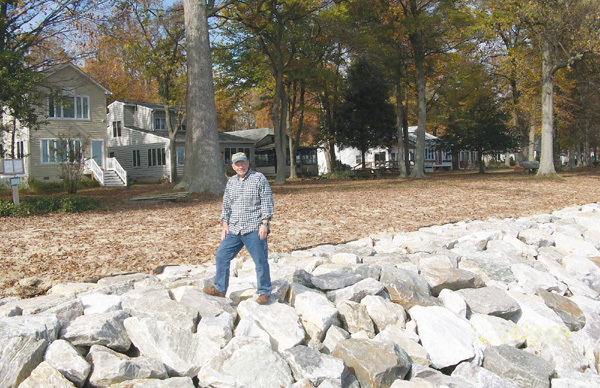 Just above the Calvert line in southernmost Anne Arundel County, Holland Point has its own problems with erosion  and struggles with its own limitations on fixes. Both communities are reluctant laboratories where the balance between environmentalism and property rights is being tested. Versions of the drama playing out in these areas might well appear where you live. Holland Point unwinds like a mile and a half of ribbon along the Chesapeake shore. Much of the community is only two houses deep and divided into Bay front and Bay view homes. But a wide stretch of community property borders the waterfront, making a commons for dog walking, jogging and greeting neighbors. At water’s edge, the land drops off sharply, with lawns four to six feet above sea level. 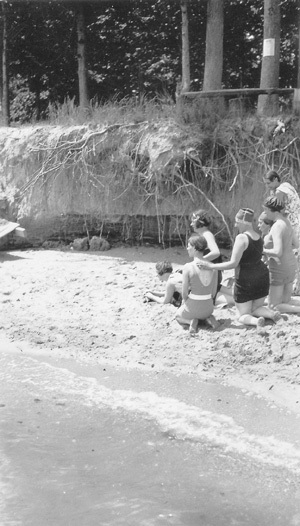 Once upon a time, Holland Point had a beach. 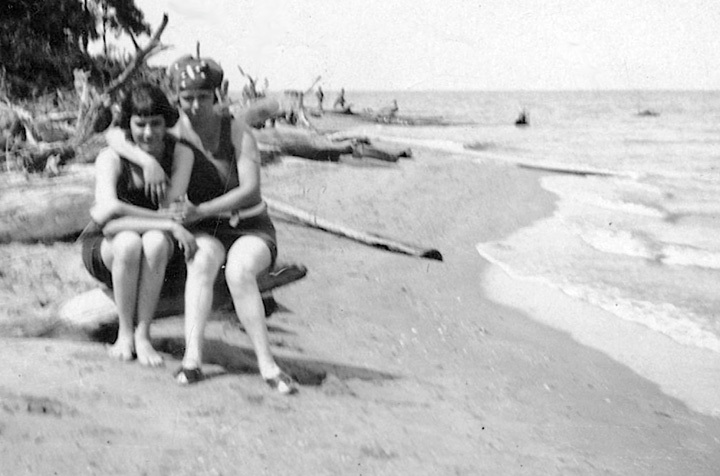 Community historian Janet Bates, a girl in the 1920s, remembers frequent storms that undercut the slope of the shore. A wooden bulkhead was built to stem the loss of land, but it sprang leaks and leached poisons into the ground. From the 1960s on, rocks piled in front of the wood helped hold erosion back. In September 2003, Hurricane Isabel exposed the weakness of the aging structure. The combination of winds, high tides and waves sweeping across the Bay chewed up piers and downed trees. Receding floodwaters left over 100 sinkholes, some of them huge, eating away the land behind the bulkhead. 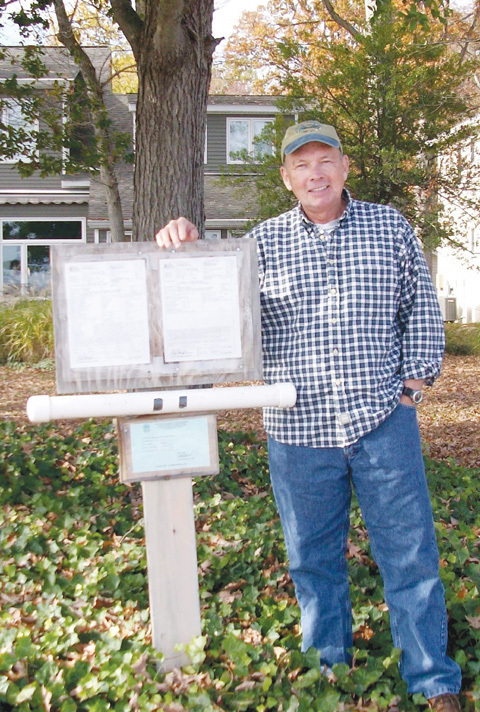 The Holland Point Citizens Association decided it was finally time for a big fix. Prime mover was Woody Young, a 63-year-old with deep roots in the community. He and his wife Kathy met as children at their parents’ summer homes. They made Holland Point their permanent residence when Woody retired in 2000, eventually renovating and expanding a weekend cottage that had been in the family for three generations. “When we moved down here, I thought I’d be fishing and hunting,” Young says. “Instead I’ve spent the last six years on erosion control.” But he seems to thrive on battling erosion, and his neighbors are grateful. Many of Young’s steps were tangled with red tape. Erosion control projects require three permits: One from the county, one from the state and one from the Army Corps of Engineers. “Not only were there multiple layers of requirements at every turn, but the state’s own agencies often disagreed with each other,” he laments. The project required engineering studies, proposals and two separate bidding processes, checking on the contractors and constant inspections from the permitting agencies. If you think such work took an engineer, think again. Young had been a principal in a family-owned wholesale business for 30 years, selling goods and supplies to local retailers. His customers were satisfied, he says, because he knew how to negotiate and paid attention to detail. Those good business habits also helped Young arrange financing for what became a $1.2 million job. Isabel had blown federal money into Chesapeake Country, so he started with a $37,000 grant from FEMA to fill the sinkholes. Preventing future damage was a much more expensive proposition and one the community’s 220-odd homeowners couldn’t afford through direct contributions. Young managed to get a $1.1 million interest-free loan from the state’s revolving fund, to be repaid over 20 years through what’s known as a special taxing district. Anne Arundel County adds a specified amount to each Holland Pointer’s annual property tax; in this case, 80 cents per $1,000 of assessed value is earmarked to repay the loan. Young also had help from an unusually dedicated state expert who had the engineering background he himself was missing. In turn, Maryland Department of Natural Resource project manager Tom Brower calls Young and Holland Point ideal customers. Brower and Young developed a phased plan starting with the removal of the old wooden bulkhead. Next, filter cloth was installed to restrict the flow of sediment while letting the soil breathe. Finally, larger boulders were laid with a more gradual slope from land to water. Big yellow excavators arranged the interlocking stones one at a time, picking just the right size and shape for this hole or that one. Now waves  which can top four feet in a storm  no longer carve out the bottom and rarely splash up over the top of the wall. Through the construction, Young held the hands of nervous Holland Pointers who saw their front yards dug up and their waterfront access disrupted for nearly a year. In 2009, the new wall protected just over two-thirds of Holland Point’s shoreline. “We started with the section most likely to face storm and wave damage,” Young explains. That’s the part that faces directly on the Chesapeake rather than the more sheltered waters of Herring Bay. Properties along the last half mile, facing north around the promontory for which the community is named, were generally less exposed. 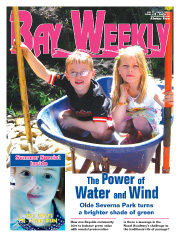 Then they suffered damage of their own from a 2005 nor’easter that left surrounding areas unaffected. Looking at the finished portion of the seawall, those owners wanted more of the same. 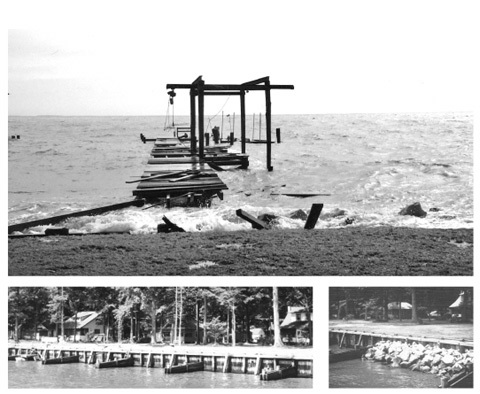 Hurricanes like Isabel in 2003 devastated the waterfront along Holland Point, top, despite a bulkhead, left, and rocks piled in front of the wood as early as the ’60s, right. But by then state money was no longer available for the type of “structural intervention” Holland Point had begun, according to documents issued by both DNR and the Maryland Department of the Environment. Instead of bulkheads and rock walls, currently in place for roughly half the Bay’s shoreline, erosion control funds now support only “living shorelines,” which are credited with being more resilient to the rising waters expected with warming trends. Living shorelines also create or preserve marshes and provide places for fish, turtles and crabs to breed. Federal support is focused on living shorelines as well. Five Arundel County projects are under way, being built with Environmental Protection Agency stimulus funds totaling close to $2 million. For areas that need some protection from wave action, the now-favored form of erosion control is offshore breakwaters or islands, known as groins, that allow for free flow of water. Rock walls and bulkheads are still allowed  but citizens now have to show they are the only way to go. Holland Point’s last half mile is likely to qualify, based on existing criteria. It faces up to two miles of open water affecting wind and wave formation, and the shoreline is over four feet high. There is an existing but damaged structure in place, and a living shoreline might not offer sufficient protection from erosion  nor fit around homeowners’ piers. Finishing Holland Point’s erosion control will take another $500,000, roughly. Just over a quarter of that amount is in the kitty. Engineering and design studies are under way. Another bug-a-boo: “yo-yo policies” that change every few years. State funding for structural erosion control was discontinued before, in 1997, only to be reinstated in 2000 after Hurricane Floyd ravaged the coastline. As for Holland Point citizens, they are shocked to find themselves on the wrong side of a green issue. Their community meetings feature long discussions about oyster cultivation, reforestation and wayward residents who cut down trees without permission. But they want to protect their property, too. What’s the value of a homeowner’s right to do so? How much difference in climate change or preservation of Bay life can living shorelines make?